You will reduce your electricity bills in two ways, as we learned in Step 1 – through exports and through self-consumption. Let’s have a quick refresher on the difference. Exports. These are the earnings you get from exporting surplus energy to the grid. In general, you can earn between 7c and 16c for every kWh of electricity exported. These earnings are easy to see, as they are line items on your post-solar bills and are subtracted from your usage charges. Self-consumption. This is solar energy that has been used directly by appliances in your home. You save whatever your tariff is: typically, 30c per kWh. I call these savings the ‘hidden savings’ of solar, because they don’t appear on your post-solar bills. Other people call them ‘behind the meter’ savings, because the savings are invisible to your meter, or the grid – which is why you can’t see them on your bill. Confused? Let’s go through one of my bills to explain. I touched on this in Step 1, but it’s an important concept so here are the details. 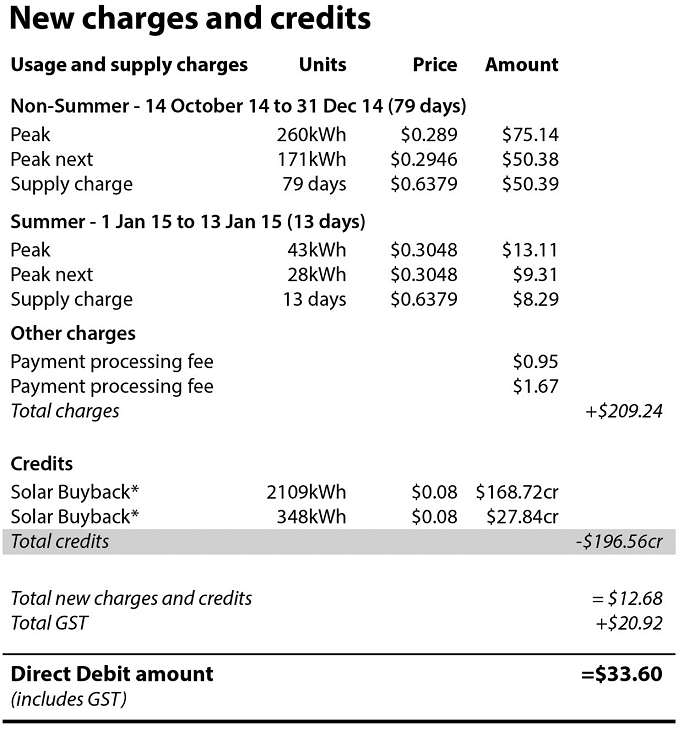 Figure 4.1 Summer electricity bill. Obviously, at $33.60 for the quarter, I’m pretty happy – but how much am I actually saving compared with if I didn’t have solar panels? 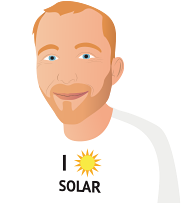 I don’t have a pre-solar bill to compare, because I added the solar when I built the house. And even if I did have a pre-solar bill, the difference between the two would be a poor estimate of savings because usage and rates both change. In fact, it’s common for people to use a lot more electricity after they install solar, because they worry less about their bills – so comparing ‘before and after’ bills can be misleading. Figure 4.2 Savings from solar exports shown on my bill. I’ve been credited $196.56 for exporting 2,457 kWh (2,109 kWh + 348 kWh) of energy to the grid. But how do I work out how much I’ve saved through self-consumed solar energy? Unfortunately, it’s not that easy. The first thing you need is a good energy-monitoring system. Later, I’ll talk about energy monitoring in detail, and I’ll suggest that you include it in your solar power system. There are lots of reasons to do so – including tracking your savings. Good monitoring systems show you how much energy your home uses and how much solar electricity you generate, in five-minute intervals. 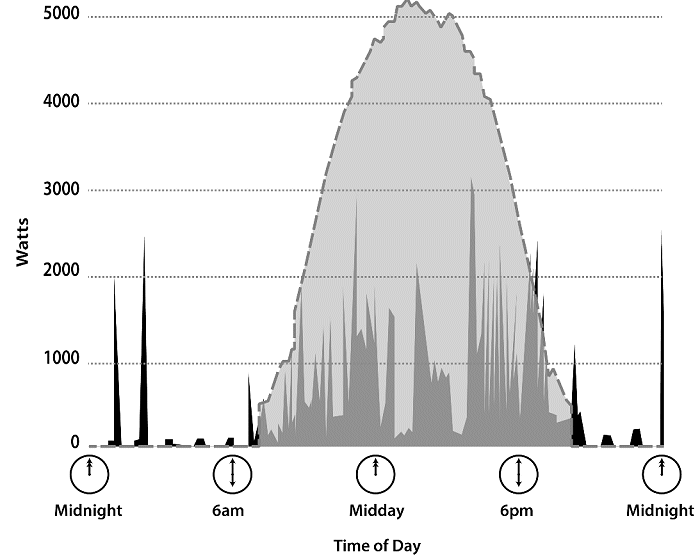 The spiky black and dark grey areas show my power usage over 24 hours – from midnight to midnight. The spikes just after midnight are the dishwasher heating the water and then drying the dishes at the end of the cycle. We put it on a timer because it’s noisy and don’t want it to disturb our evenings9. You can see the house start to wake up at 6am. Energy is used throughout the day. Mostly, it’s the clothes washer, oven (cakes! ), computers, and rainwater pumps. We put the kids to bed at 7:30pm and energy use falls off. Figure 4.3 Breakdown of energy used in my house over 24 hours. The dashed line shows solar electricity generation. If the dashed line is above the spiky area then we’re generating more than we’re using. Any electricity being used at these times is self-consumed solar energy. I’ve shown this energy as dark-grey in Figure 4.3. Any excess solar gets exported. This is the light-grey area in the graph. The black areas show when I have to import from the grid. The total amount of energy used by my house in the 24 hours shown is the black and dark grey areas combined. My monitoring system tells me this is 13 kWh of energy. Of that 13 kWh, 10.33 kWh is in the dark grey area. This is my self-consumed solar energy. 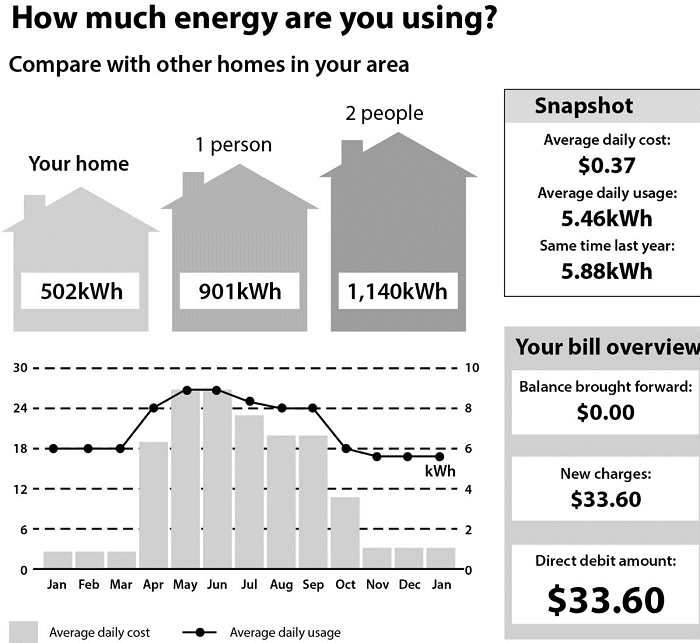 At $0.31 per kWh, that means I’m saving $3.20 per day through self-consumption. My exports on this day add up to $2.51 (31.4 kWh x $0.08). That means most of my savings are coming from self-consumption. My total savings for the day are $5.71. If I extrapolate this to the 93 billing days covered by my bill and take into account that some days were overcast, the total savings come to about $500 for the billing period – $200 from exports and $300 from self-consumption. If I extrapolate this to the full year (taking into account that winter generation is lower), then my savings for a whole year come to about $1,800. Key point: Solar savings have two components – exports and self-consumption. We need to account for both in our predicted savings. 9We should rearrange when we pack and unpack the dishwasher so we can run it during the day, from the solar. See Step 7 – shifting loads.